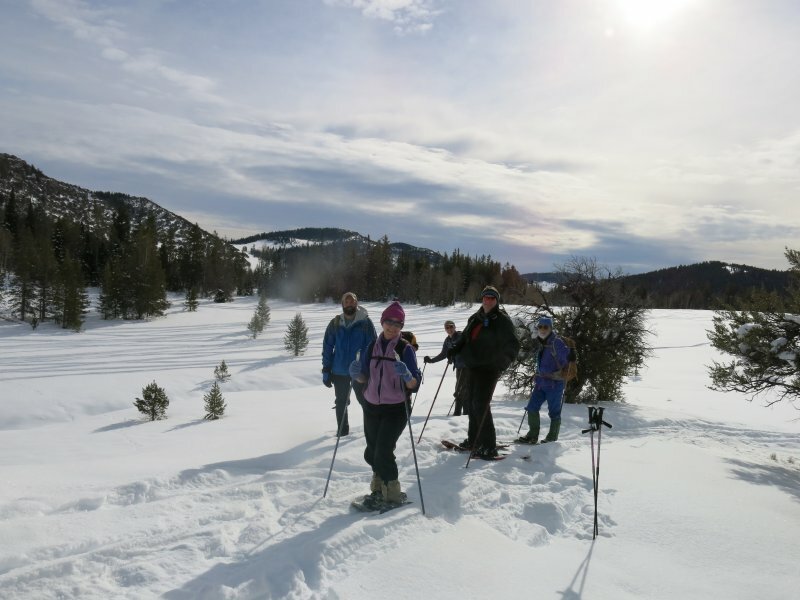 Seven Cache Hikers escaped the single-digit temperatures and murky air of Cache Valley for pleasant winter excursion to the North Fork of Amazon Hollow. Dave P. and Dave W. were on skis, and Rick, Kathy, Bill, Dan and Jim used snowshoes. We prepared for a car shuttle by leaving Jim's vehicle where North Fork Amazon Hollow crosses US 89, and the other cars drove up to the Highway Sheds Winter Trailhead. Only one other car was there, but tracks in the snow showed there had been a lot of recent snowmobile activity. With temperatures in the mid 30's, it didn't take long for us to shed clothing layers as we traveled north along the eastern edge of the North Fork of Amazon Hollow. We ate lunch as we enjoyed a view to the west and then decided to continue with Dan's plan, although this would mean a later return because our start had been delayed. After about 2 miles of travel, we encountered a long, open ridge heading down toward the bottom of the hollow. Here, the two skiers left to schuss down that inviting slope while the snowshoers continued on their contour route. When they reaching the bottom, the skiers headed up the hollow to meet the others as they snowshoed down. After arriving at the highway, the car shuttle operation was completed when Jim took the drivers back to their cars while their passengers waited at Amazon Hollow for their return. This was a good trip. We enjoyed partly-sunny skies, comfortable temperatures and good skiing, with a 4:30 return to Logan.